From a simple Wireless Access Point through to a Multi-tenant, Managed Wireless Network, we have more than 17 years of experience in this field. Our expertise is in recommending, designing and installing systems that match your exact requirements but stay within your chosen budget. Huge advances being made in wireless communications. We are now installing systems with both long-range 2.4Ghz and the latest high-performance 5Ghz frequencies for very fast wireless data transfer. We have helped business all over the UK to improve the range, security, manageability and scalability of their systems. 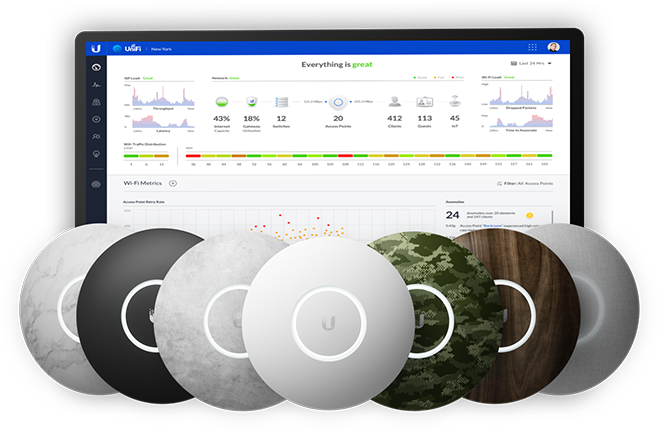 We install systems from Ubiquiti, DrayTek, Netgear, TP-Link & Cisco and many more. A recent project has enabled a charity to provide secure wireless systems over a large area that is split for secure staff & patient access. With a single management system enabling an administrator to switch various areas on and off and change passwords, channels and features on all long-range WAP (Wireless Access Points) from one simple control panel. Is your existing wireless network secure? Do you need better coverage? Is wireless performance becoming a real issue? Have you considered the latest 5G systems? Could you benefit from a system that captures selected data, restricts websites, branded for your organisation, can analyse trends and can generate revenue? You need the ‘Ubiquiti Captive Portal’. Perhaps you need to link multiple buildings with a point-to-point wireless system or simply need to download files faster? We can help.